Apple’s FaceTime is incredibly simple to use, but only allows you to call fellow iOS or Mac users.Google’s latest app, Duo, attempts to recreate the simplicity of FaceTime but works across Android and iOS. “Video calling is full of friction right now,” says Amit Fulay, Product Manager for Duo, Google’s latest take on video calling. Announced at Google I/O earlier this year alongside instant messaging app Allo, Duo wants to solve this with an app that’s fast, reliable, and easy to use. Gadgets 360 was given a chance to use the app for some time before Tuesday’s official rollout, and in our experience it worked well. According to Google, the rollout has started now, and will be coming to all regions over the next 24 hours to all users, but as first impressions go, there’s a lot to like about Duo. The first thing that strikes you is how simple and basic this app is. All you need to sign-in is a mobile number, and that’s a strategy Google is hoping will help it win over more first time users in India. As a concept, Duo’s bare minimal interface works in its favor. You open the app, and your front video camera is already on. There’s a video call button, followed by your recent contacts next to them. 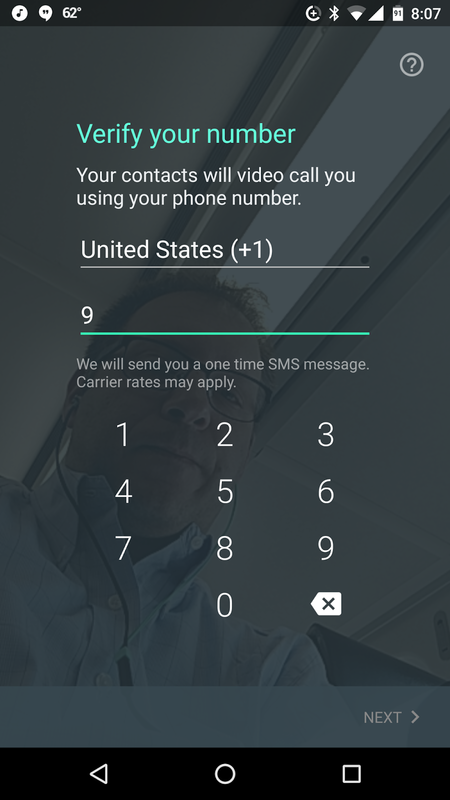 Click on the video call button, and Duo shows the list of all contacts who have the app, followed by the entire phone book, with the word invite next to these names. Tap on the contact’s photo or name and your video call will begin. Google will remind you the video is live to other user, even if they have not picked up the call yet. This is similar to FaceTime, where the video is live before the call is picked. And no, you can’t do group calls with this. The Limit Data Usage option is on by default in this app, and in the settings you can add a list of Blocked Numbers as well. However, when your smartphone is on low battery mode, Duo does show an option to disable video, and just continue with an audio call. But the app doesn’t have a specific audio call option highlighted, like FaceTime does. A missed call from a friend shows up below the contact’s photo, and again you can just tap on it to call back. It’s not really easy convincing people to move to a new app, and especially just for video calling. I’m not sure how I will convince the friends who use FaceTime to make Duo as the default app. For families that use FaceTime to connect, very few might see the need to switch, simply because there’s nothing wrong with the app they are using just now. Unless they give up their Apple product, and move to Android because unlike FaceTime, Duo is cross-platform. But then so are other apps that Duo will need to beat with Skype being one of the major players. Nonetheless Duo pips WhatsApp by launching video calling first, and for once, you have a Google app that only needs your mobile number. In India, that’s a big win, because not everyone prefers signing-in via their Google account. Duo is Google’s next big step in mobile, and we know this is a space where most battles between technology companies will be fought. Facebook with its WhatsApp and Messenger already has a significant grip on this segment, then there’s the rise of Snapchat. And now Google wants to fight back with Allo and Duo, where it keeps messaging and video calling separate. For sure Duo is easy to use, which is being touted as the highlight along with network efficiency. But can it become the default video calling app for everyone is another question. While you’re learning about Google Duo, I recommend you also read Where it fails. Setting up Duo could not be easier. First step is to download and install Duo from the Play Store (or iTunes Store if that is your thing). Once installed, tap on the Duo icon to open and the setup process begins. You will be prompted with a screen to enter your location and your phone number. This number should be your mobile number for the device you are installing the app on. After the number is entered, tap on next. From there you will be prompted for a verification code. The code will be sent to your number through your default SMS app. I was using Hangouts at the time, and the verification code sent to me was automatically entered into the verification screen. But if that does not happen for you, just enter the code. The application will verify you and you will be all set. Click the Video Call button to start your first call. And bam, you are now off and Duo-ing. Once you’ve verified your number, you’re signed up and ready to start using Duo. One feature Google was very fond of when Duo was announced is called Knock Knock. When you place a call in Duo, you immediately begin streaming video. This allows the person you’re calling to see what you’re doing, and more importantly who is calling, before answering. There’s one big caveat here: Knock Knock will only work with contacts you’ve saved to your phone. So if someone you don’t know is calling you, or a friend is calling from a new phone number, Knock Knock won’t work. The same thing happens when you call someone. If your number isn’t saved as a contact, Knock Knock is off by default. Duo will let you know if the other person can see you by displaying “Your video is visible” at the top of the screen. Now, as you can imagine Knock Knock could lead to some awkward moments. Google does its best to let you know you can be seen, but it’s easy to forget. You can turn Knock Knock off in the app’s settings. Tap on the menu icon in the top-right corner >Settings > Knock Knock to turn it off. After each call, Duo creates a shortcut to easily start a call with that person in the future. You can long-press on a thumbnail to bring up additional options: Remove from list, Block number, Add to contacts and Start a video call. If you decide Duo isn’t for you after trying it, you should remove your number from the service before deleting the app. To to that, tap on the menu icon > Settings > Unregister phone number. A few seconds later, Duo will display an alert letting you know your number is no longer tied to the service and then you’re free to act like Duo never happened.